For all the the Doubter`s out there against a black James Bond, just watch this and you`ll change your mind. The original Eqaualizer starring Edward Woodward in the late 80`s was a brilliant piece of TV and he was very much different to this version. But should they change the format, well why not? as Denzel is so the right choice for Robert Mccall. Just because the actor has changed,and is black should it matter. No it should not. Denzel is one of the finest actors in Hollywood. And he was perfect for this role. A mild mannered man works in a hardware store,is a lonely man who never sleeps,and is regularly going for a coffee at a local 24 hour diner in the small hours,to read one of his many books. Where he regularly talks to a young lady,who maybe is a prostitute,but he is not one to judge,and he talks to her,subconsciously trying to change her mind about her profession. One day the young woman doesn't turn up to the diner,he asked the diner owner,who informs him she was beaten by a client and she is in a bad way. This then makes Robert to do something, he approaches her pimp, a Russian low level gangster,he offers the Pimp a small amount of money to buy her out of her contract,which the pimp refuses, alongside all his goons. The Pimp tells Robert to ''leave all he will be very sorry''. So Robert says one more time ''let her go'',they say no. So he says '' 19 seconds'' and sets the timer on his watch,and takes out and kills all the goons in a gruesome way,and disappointed that it took him 22 seconds. We then have the rest of the Russian Mafia after him, wanting revenge, thing is Robert Maccall is not a normal bloke, with no record,a ghost with special skills in the art of killing. A master killing machine,who takes out all the Mafia goons in a blink of an eye. Even when they send a professional hit man from Moscow,will he be any match for Robert? Well what do you think. This film is an adrenaline pumped film,with so much violence,death,destruction, I will say it is the best action films I have seen in a while, directed by the excellent Antoine Fuqua the director of great films such as Training Day, Shooter, Olympus Has Fallen, a great action director who is never afraid to show violence and blood. 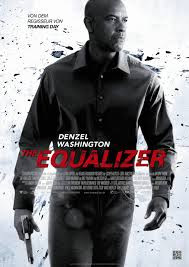 This film I would,and doesn't happen that often and give it a generous 5***** it is bloody brilliant,and one note to mention, that is Denzel has signed up for the sequel. For the first time in his career, he has never made a sequel,but will carry on with the vigilante Robert McCall .